Today's editing experiment uses the 'film noir' filter in Final Cut Pro and slowing and reversing footage of HALA in Duckett's Common. She seems to be controlling the ball without touching it. Next time I am shooting such footage I want increase the frame rate per second to get a clearer image. Today I have been experimenting with photoshop. The image below is one I worked on a couple of years ago whilst I was at City Lit. The photograph is one of a half built house in Cyprus. There are many of these concrete shells along the coast in Cyprus. I made several drawings and paintings of them whilst living there. Initially I found them quite ugly but by the end of my time living there they seemed as natural a part of the landscape as the mountaints. This image captures an early and frustrating time working in Photoshop. The text, 'wish you were here' should be bigger so I will to return to it. Today was difficult and I found myself struggling to get into anything properly. I originally intended to go to an event on art schools in Falmer but there are problems on that train line and I realised it would be impossible to get there and back in one day without being completely exhausted so I did not go. Instead I decided to start thinking about my presentation for this semester. I think I will focus on Performance Magazine which was founded in the 1970s and intend to consider its impact on live art in general. That was the plan but I could not resist looking at a book I got from the university library that my tutor recommended - Aoife Monks’ The Actor in Costume. Monks explores the idea that the act of putting on a costume or ‘costuming’ comes with risks and possibilities for the bodies and psyches of actor and audience alike. This feels very pertinent to me as a struggle with the reality of subjecting my interest in dressing up to an academic process which leads me to reflect on the choices I made when devising HALA’s costume. My essay last semester focussed on the work of Oreet Ashery who is a master of costuming and its potential effects on the audience. Her work as her alter ego, an orthodox Jewish man, Marcus Fisher allowed audience members the opportunity to explore whatever issues they might have with orthodox Judaism. Her alter ego acts as a mirror, in which the viewer is confronted with their relationship to those they consider different or ‘other’. Aoife' Monks’ focus on costume and costuming is extremely helpful because I struggle with the concept of an alter ego because it is too limited. I prefer Jung’s idea of shadow selves which allows for various versions of ourself or identity. I procrastinated a lot today and did not work on the presentation I have to do. I listened to Blindboy’s podcast ‘Bunsens Junk’ podcast in which he talks about his own challenges with procrastination and how he embraces failure which was helpful in reminding me that I am not alone in facing these difficulties. His podcasts are very informative and entertaining and I thoroughly recommend them. I am using this online tutorial on masks to familiarise myself with this feature. In Final Cut Pro, masks allow you to block out an area for different treatment. I used a circle which I placed on the house in the picture. It is a technique which has a lot of potential however I am only just getting to grips with it. The third image has the ‘comic cool’ effect added. I like the way the shadows in the grass and cloud formations are exaggerated. There was a piece about cellulite on This Morning recently which I filmed with my phone. I used the ‘comic basic’ effect to alter the image. I had some old footage of HALA making notes so I reduced its size, keyed it and overlaid it with the This Morning footage. The effect is one of parody however I think HALA is genuinely interested to learn about banishing cellulite. This film is almost a minute and a half. The footage is from the summer. I used the ‘comic cool’ effect in Final Cut Pro to get the cartoon like look. I like how it abstracts the figure and background and makes it feel otherworldly. The movement of the grass and leaves reminds me of Tove Jansson’s drawings of Moominland. I downloaded the music for this film from the Free Music Archive. There was a helpful presentation on sound from a fellow student at Queen Mary’s this week which reminded me that it can be soothing to listen to background noise that has been slowed down. In this clip I experimented with slowing down the footage and leaving the background noise of the traffic in. As the audio slows down the sound becomes deeper and stranger which suits HALA’s rituals which are unexplained. I wonder what she is doing? Today I worked in the film studio at Queen Mary University of London where I am studying for a Masters in Live Art. Today I sat in front of the camera with a green screen behind me. I decided to just look directly into the camera for a while with no particular plans or expectations. As I looked at the camera I thought about how much time I have spent watching moving images on television, in the cinema, on my laptop and on my phone and I remembered how exciting it is to be on the other side, to be sending images out into the world instead of being the recipient of them. I put the footage of myself into Final Cut Pro and ‘keyed’ it so that I could put in a new background. I experimented with leaving it empty. Then I tried various background colours using the ‘Colour Board’ and after much dithering plumped for this purple pink. It is interesting to notice how the colours affect the mood of the image. I accidentally ‘keyed’ the footage more than once which left me with a darker image which I preferred. I also played with other effects including an effect called ‘flashing’. I kept this for the clip below. It reminded me of having my photo taken in a photo booth. It appears in the clip below as if a flash light is going off in front of me but because this was added afterwards I am not blinking. Please note there are flashing lights in the film. It is just over a minute long. Recently I have been playing around with Final Cut Pro (video editing software) in order to alter films made using my phone. Recently I discovered ‘Comic Looks’ in the Effects section of Final Cut Pro. I applied these effects or filters to footage of myself dressed as HALA. The first image was created using the ‘Comic Ink’ effect (which turned the image black and white) and the ‘Comic Sepia’ effect. I like the comic book effect that this gives the image and the way in which the pattern on her headscarf is clearly defined. The second image is the same but with ‘Comic Cool’ added. Layering these effects on top of each other highlights what FCP defines as the ‘ink edges’ particularly on the face. This makes it look like the skin is marked or scarred. I like the way it relates to the pattern on the scarf, as if the pattern is consuming her or vice versa. I also like the pixellated look of the trees in the background which appear abstracted or impressionistic. The title of this sketch, Buz Gibi has several meanings in Turkish, including clean and fresh and ice cold. I was thinking about Hala being resentful about doing everyone's washing. I use the 'cast' special effect here, which I end up using quite often. It is a bluish black and white that makes me think of remembering something. I am interested in how I can combine moving and still images of Hala and her environment. I like the sound of the water swishing around in the washing machines and the sound of metal on metal as the coins are pushed into the machine. I chose still images of Hala because I think this heightens the sense that she is stuck when juxtaposed with the moving images of the washing machines. It is as if the machines are more alive than she is. I am interested in GreenScreenRefrigerator by 2008 Turner Prize winner Mark Leckey, where we are invited to explore the inner life of a Samsung refrigerator, which I wrote about in an earlier post. Thank you to Sonia Vico and Green Lanes Launderette, Haringey for helping to realise this sketch. MUSIC: DMX feat. Sean Paul - Here Comes The Boom and Sezen Aksu - Hala Haber Bekliyorum Senden. Thanks to Maura Moore, Helen Curtis and Mark Winfield for the photos. I decided that my character, Hala, lives in a launderette. Having to do mountains of laundry is one of her many grievances. This photograph was taken by Sonia Vico. This week I have been experimenting with Final Cut Pro and footage of myself performing as my character, Hala. This is a still from a video sketch I made this week. 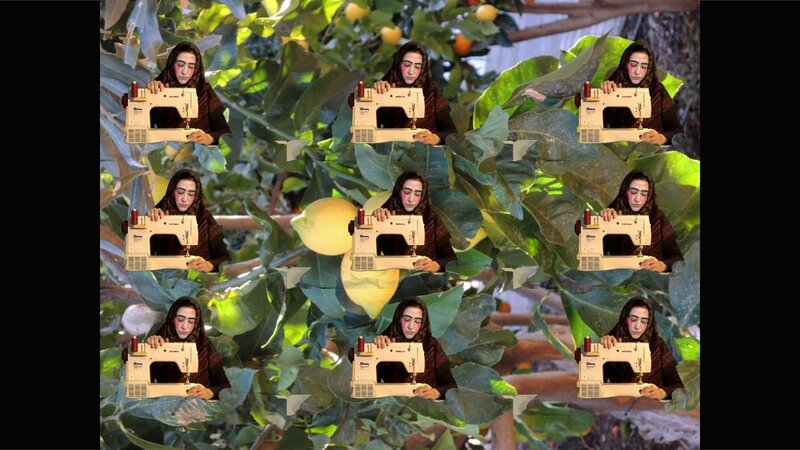 I achieved the nine Halas by using the 'tiling' option in Final Cut Pro and 'keyed' the green screen I performed in front of so that I could put my photograph of a lemon tree behind my footage. I used to collect Russian dolls. I find them beautiful and creepy at the same time. It is disturbing that the smaller 'baby' ones that emerge from the larger ones are identical to the older ones and remind me of The Smiths' song Reel Around the Fountain which goes: It's time the tale were told/ Of how you took a child/ And you made him old. The Russian dolls came to mind when I stumbled on this tiling special effect. Also Hala's dark eye make up and pink cheeks draws on the look of Russian dolls. My final term project is called Resentment Rites. I have chosen this title because I am interested in how feelings of resentment and bitterness are passed down from one generation to another, how we carry these emotions and how they are expressed. My last film Run for the Border could be considered a tragicomedy and I am interested in exploring this genre. I have been thinking about lemons as a metaphor for bitterness so I will begin by exploring the tragicomedy of eating a lemon. My initial influence is Marina Abramović eating an onion in her 1996 work, The Onion. In addition to eating a lemon I will film myself doing other absurd acts or 'resentment rituals'. As well as Marina Abramović, I am influenced by the work of Pedro Almodóvar, in particular the characterisation and appearance of his female characters which is why I chose a bright red dress for this performance. The image below is a still from footage of me eating a lemon. The first attempt was not particularly successful as I had practice eating lemons beforehand and I made it look easier than I wanted it to appear. I was looking for exaggerated facial expressions that might be made whilst eating a lemon and did not get so many of those however the image below does convey something of the experience. I was filmed against a green screen background which gives me the option to 'key' this area using Final Cut Pro. For the image below, I chose a black background because I liked the way it focuses the viewer's attention on the character eating and the lemon. The black also gives a sort of 'lost in space' look and I imagine her eating lemons in space forever.